4. 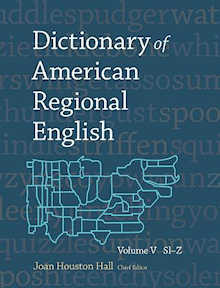 Reviews: Dictionary of American Regional English. Hat-dropping Following last week’s piece, Michael Templeton noted another story about the origin of at the drop of a hat, the dropping of a hat as a starting signal for a duel (other sources suggest the dropping of a handkerchief instead). He found this dismissed in an issue of the delightfully named US publication The Great Round World and What is Going On in It, dated 1898. The author very reasonably pointed out that duellists waiting to exchange fire were unlikely to want to turn away from their opponents to watch for a visual signal. Voting World Wide Words has been nominated in the Mailys, the LSOFT Choice Awards. As the contest is organised as monthly heats, this is my last chance to ask you to vote to ensure we win the April one. The rules allow you to do so every day if you wish. I was looking at this word in some book or other a while ago — my ageing memory fails to remind me which — and wondered how such a collection of letters could have come together to make an adjective that meant bad-tempered, argumentative or uncooperative. That’s because you don’t know her as well as I. Ecod! I know every inch about her; and there’s not a more bitter cantanckerous toad in all Christendom. She Stoops to Conquer, by Oliver Goldsmith, 1773. A curiosity of this passage is that it appears in numerous places as “bitter cantankerous road”, an unfortunate error that led the late Ivor Brown to base a molehill of discursiveness on this pimple of misinformation by reasoning falsely that it could apply to things as well as people. The fault is traceable to a misprint in volume two of Farmer and Henley’s Slang and its Analogues of 1891, which quotes only the last part of the excerpt, so denuding it of the context that would expose the error. (We may forgive the absence of the second c from cantanckerous, which modern editions of the play also omit.) The error has been perpetuated by writers who borrow the quote without troubling themselves to check the original. It must indeed have been new in Goldsmith’s day, for the good Doctor Johnson didn’t give it house room in his Dictionary of 1755. It may be that he felt it was too slangy for him — Farmer and Henley called it “colloquial” more than two centuries later. But for Goldsmith it already had the sense we know today, of a person with a quarrelsome, cross-grained, ill-natured personality. One proposal is that it was a blend of two words, each of which by itself suggested its sense: contentious and rancorous. But it’s also argued that it can be traced to the Middle English conteke, contention or quarrelling, via its compound conteckour, a person who causes strife. The latter word may have later changed spelling under the influence of these other words. Either way, its sound is appropriate to its sense, evoking jangling metal objects, and that may be why it has survived and prospered, even without that extra letter. Life imitating fiction A rather splendid word has entered the UK political lexicon in recent weeks. It was uttered in the House of Commons during Prime Minister’s Questions on 18 April by the Labour leader of the Opposition, Ed Miliband. He described the coalition government as an omnishambles because of several recent allegedly serious policy and public-relations blunders, including the press excitement over a trivial dispute about whether the Conservative Prime Minister, David Cameron, had ever eaten a Cornish pasty and where (this inevitably became known as pastygate). The Daily Mail commented that omnishambles “described the combination of tragedy and farce that characterises modern politics” and the word has been gleefully taken up by many commentators, some in the Conservative press. It began life in The Thick of It, a satirical BBC TV series about Westminster politics created by Armando Iannucci; it was said in an episode in October 2009 by the foul-mouthed government head of communications Malcolm Tucker, played by Peter Capaldi, though he meant by it one particular person’s incompetence in everything she did (“you are a f****** omnishambles, that’s what you are!”). The word appeared a few times after the broadcast but Ed Miliband’s use set it trending, as they say over on Twitter. Its popularity is indicated by compounds that are already being coined, including omnishambolism and omnishambolic. It is one of the hallmarks of lexicography that those who engage in it are destined for the long haul. A marked tendency exists for the initiators of dictionary projects to suffer the fate of Moses and not survive to witness the end of their endeavours. James Murray never saw the Oxford English Dictionary in its completed state. Likewise Professor Fred Cassidy, who began the work of compiling what has become an extraordinary five-volume work, the Dictionary of American Regional English, died some years before the final volume went to press. But now we have all five volumes, a stack 11in (28cm) high weighing 28 pounds (13 kg), comprising some 5,500 pages. Such crudely gross measurements do little to communicate the labour of nearly half a century that has been put into editing and compiling the work. In strict truth, the project had been put in motion more than a century ago, in 1889, when the American Dialect Society was founded to make a work that would rival Joseph Wright’s English Dialect Dictionary. A great amount of material had already been collected in a rather haphazard way when in 1962 Professor Cassidy, Professor of English at the University of Wisconsin-Madison, was appointed editor by the Society. Fieldwork began in 1965 and took five years. Researchers went to more than a thousand communities in all 50 states, asking hundreds of questions of 2,777 individuals about their words for everything from time and weather to domestic animals to courtship and marriage to children’s games. These interviews were augmented by a volunteer reading programme of newspapers, diaries, biographies, letters, histories, novels and government documents. More recently, the vast resources opened up through documents being digitised and made available online has made the compiler’s job — as the preface to this final volume comments — “much more challenging while at the same time distinctly more rewarding”. In those 5,500-odd pages we now have a record of the regional speech of the US, taken at a time when the march towards conformity through widespread exposure to the national media hadn’t progressed as far as it has today. However, that snapshot has been updated with much subsequent research work, particularly in the later volumes, which confirms that regional American speech is still very much alive. In this fifth volume alone appear spatzie for a sparrow; Tom show, a travelling production of Uncle Tom’s Cabin; yes-ma’am or thank-you-ma’am, a sudden or startling dip or bump in the road, and upscuddle, a noisy quarrel. In the southern states to step off the carpet, or just to step off, is to get married; out west at one time a horse that bucked violently was said to unwind; a century ago a squirrel load was a very small drink of hard liquor; in Wisconsin on the other hand a whoopensocker is a large or strong drink but also an extraordinary thing; if you’re caught in the Wewoka switch you are utterly lost, though you will be in Oklahoma, the only state where the expression is recorded; a tin can alley is a poor or shabby part of town (so first cousin to one of the early meanings of tin pan alley); and in the south Appalachians a swarp is a blow or an attempt. Once you start reading entries you’re lost. The pity is that the cost of the complete set ($545.45) is beyond the pockets of most readers, who will have to hope that some nearby library has the funds to acquire one. There is a proposal to put the whole dictionary online next year, which will be wonderful if it’s priced economically. We can hope that it will add an invaluable research tool that’s impossible in the printed volumes: the ability to extract vocabulary by state or region, so enabling researchers to study the work by locality and allow writers to ensure that their language is geographically consistent. • On 21 April the CBC News website had the headline “Vancouver airport pilot to expand”. Or it did when James Helbig saw it. The text now reads “Vancouver airport self-serve pilot expands”. Possibly better. Last modified: 28 April 2012.